Setting up a toddler-friendly kitchen doesn’t have to be hard at all! All you have to do is follow these simple tips and it’ll be safe, secure and ready for having your toddler in the kitchen with you in no time at all! 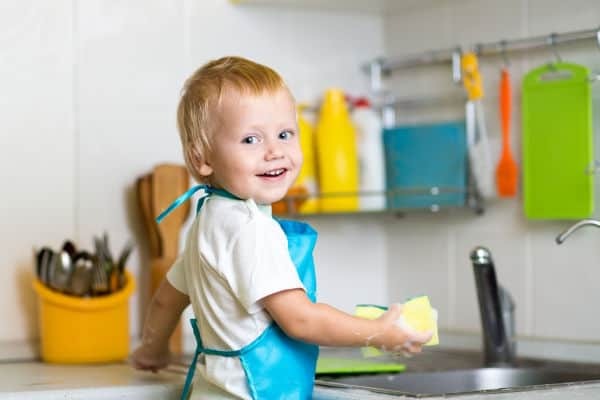 While the thought of a toddler working and helping to cook in the kitchen can be a scary experience for some, it is possible for you to not only make having your toddler in the kitchen with you safe, but fun as well. Remember, although you are setting up your kitchen to be a safe area for your toddler, they shouldn’t’ be left alone in the kitchen. Use these simple tips for getting your kitchen area ready for your toddler to become a mini-helper or to become your sous chef! Why have a toddler-friendly kitchen? You might be amazed at how many kitchen skills your toddler can do. Your toddler probably will love the chance to help you in the kitchen making meals and baking. If they are going to want to be in there with you, make the best of it. By setting up a toddler-friendly kitchen it means your toddler can be in your kitchen with you without worry and you both can have fun. Don’t let the thought of setting up a toddler-friendly kitchen bog you down. 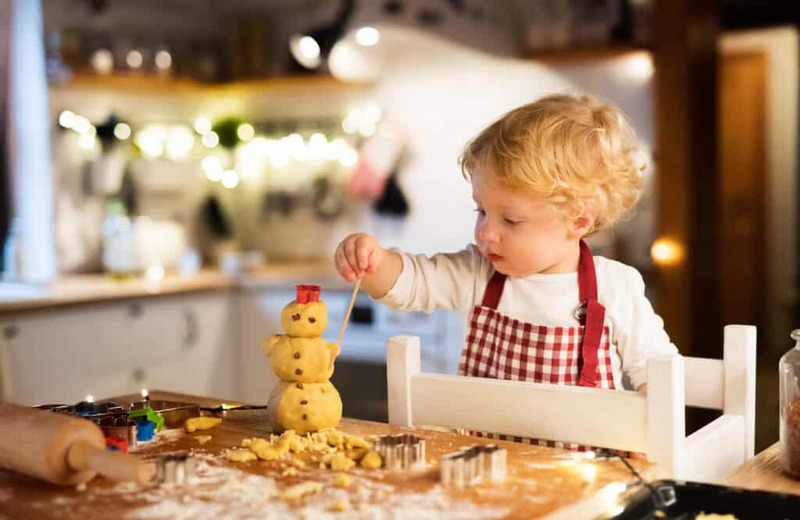 These simple tips are ones that anyone can do to make their kitchen an inviting and welcoming place for little ones to be. You can do all the baby proofing and toddler proofing that you want, but until you drop down to their level, you won’t be able to see what they’re going to want to explore. Crawl around on your hands and knees or just sit cross-legged in the middle of the kitchen floor and look around at all possible scenarios of things to be explored. If you see something that you “think” they might like, more than likely they will and it’s time to make certain that it’s safe for them to do so. We always would take the lower drawers and put items in here that our kids could use and play with without breaking. Think measuring cups and sippy cups. I’ve kept wooden spoons and serving utensils in easy reach for my toddlers. They can play with these, it’s easy to throw these in the dishwasher or give them a quick wash before putting them back into the drawer. Your goal here isn’t to scare them, but more to educate them on everything in the kitchen that needs to be on their radar. They need to know that the stove and oven are hot. One way that I did this with my kids was to turn on the burner and the oven and let it heat up. Then, I’d bring my hand close enough to feel the heat and say “Ouch! Hot!”. My toddler would then copy what I did. They never put their hand close enough to actually get hurt or burned, just enough to feel the heat. I first did this with the stove, then with the oven. While this worked with my kids, it is not guaranteed to work with yours. So try and see. This doesn’t make it so your toddler can be left unsupervised around the stove/oven, but talking and helping them understand that they can be hurt by these will help make them be more cautious around them. It’s also important to let them know that knives are sharp and can cut. Talk to them about how they shouldn’t climb on the counter and try to get things out and down by themselves. The more that you talk to them about these dangers, the more that they’ll remember and stay clear of them. It’s no secret that toddlers are independent. They’ll do anything and everything in their power to prove that to you each and every day. When it comes to them exerting independence in the kitchen, let them know that they need you to be there with them at all times. This doesn’t mean that you take it over from them, but you do your best to show them the correct way to do things in a way they’ll be safe. Toddler boy making gingerbread cookies at home. Christmas time. If your toddler wants to help, show them the way. Teach them cutting skills by starting them off with using a butter knife. If you need some guidance on teaching your kids cutting skills, this is a great course. Show them the proper way to use a spatula. Every utensil in the kitchen has a job, so why not start your toddler off early in learning how to use them safely? Not only will they love learning from you, but you’ll also love knowing that they’re using things properly and safely. Having areas in your kitchen that you don’t want your toddler to explore is fine. You just need to make certain that you have the proper safeguards in place to keep them out. Putting draw locks on your knife drawers or cabinet locks on your fine china pieces are a great way to keep your kitchen toddler safe. Not only does this let them know that they can’t explore, but they won’t be able to either no matter how hard they try. One of the best ways I’ve found to have fun with my toddler in the kitchen is to make sure it is easy for my toddler to help me. This includes having special equipment just for them as well as letting them use some of mine. If you only have ceramic and glass mixing bowls, invest in some that won’t break if they were to accidentally fall to the floor. Melamine or metal bowls are both fairly non-breakable and come in several different sizes. A step stool tower is another great way to make it easy for your toddler to help in the kitchen. Using one of these allows your child to safely be at counter height, they are able to climb up and down it, but it is more difficult to fall off of vs standing on a chair or stool. If you are concerned about slipping, you can also add in some non-slip adhesive pads to it. One easy way to include your toddler in your cooking or baking is to let them help with measuring or if you prefer to do the measuring, they can pour out the measuring cups and spoons filled with ingredients into the bowl. Another way I found to make it easy is to give my toddler his own bowl to add ingredients into, a bowl of flour with some measuring cups and spoons. He was able to measure his own ingredients all by himself. Acquiring a small broom and dustpan that is sized for your toddler and keeping them in an easy to reach area will make it easy for your toddler to also help clean up. At this age, your toddler will love help sweeping in the kitchen as long as you make sure to make it sound fun. 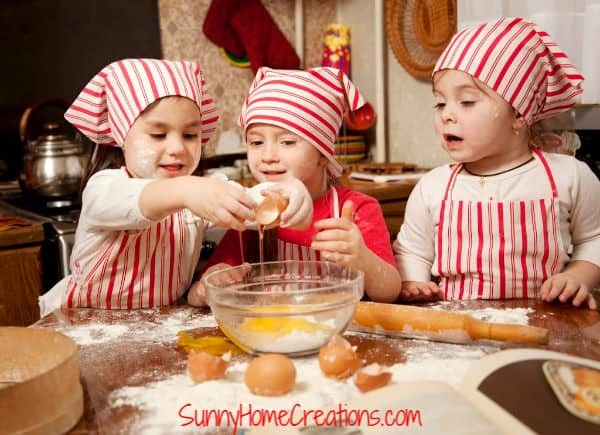 Making a visual for your toddler to show them what they can do in the kitchen is a great idea. Having a picture of the sink and dishes or even just the broom show your toddler that they can help wash dishes and sweep the floor and know that those things are safe for them to do. You can even take it a step further and have activities with a big red X through it showing them the tasks that aren’t safe for them as well. That way, it leaves nothing to the imagination and they know exactly how and what they can be doing in the kitchen. Setting up a toddler-friendly kitchen is a great way to set boundaries for yourself and for your child. Some kids respond better to words, while others need visuals and examples to know not what to do. If you explain to them that your ultimate goal is to keep them safe, happy and healthy, they’ll understand that there is a reason for the limitations and the rules. Toddlers have a great memory so make certain that you’re explaining to them “why” they can’t do something in a way that they’ll understand and relate to. 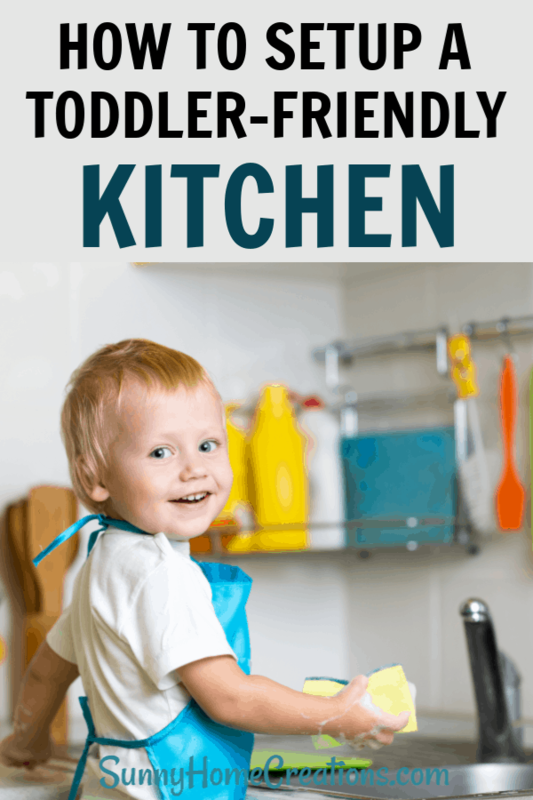 The sooner that you can implement these tips to keep your kitchen toddler safe, the better that you’ll feel about your toddler wanting to hang out and help you in the kitchen.